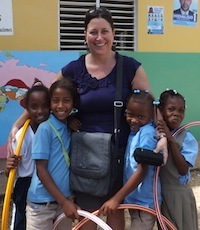 I’m in a schoolyard in the Dominican Republic, surrounded by smiling kids. How did I get HERE? It was not a straight route, I can tell you that. It had twists and turns that took me after college to live in Washington DC, Ann Arbor, Prague, San Francisco, Beaune (France), and Sydney. You’d think I’m running from the law, but no—I’m just in a constant state of reinvention or perhaps refinement. Now in my mid-40s, I have three Master’s degrees, and I’m onto my third career. When I kept returning to school, some people asked why I didn’t just go ahead and get a PhD. These people didn’t know me very well—when there’s so much I’m interested in and so many places I want to see, why would I narrow my focus? Instead, over a period of two decades, I’ve followed my drive to learn and to travel. This took me from a job as the International Manager at the San Francisco Chamber of Commerce to a decade of working in the wine industry…and now it has brought me HERE, to this schoolyard. I work for a nonprofit started in 2009 called the Global Soap Project. Did you know that 2.8 million bars of soap are thrown out per day in the U.S.? And did you know more than 2.4 million children die each year from hygiene-related illnesses? The single most effective and affordable way to prevent these deaths is hand washing with soap. So, the founder of our organization had an idea. Hotels donate to us their discarded soap headed to the landfill, and we reprocess it into beautiful new bars we deliver to orphans, disaster victims, the chronically poor, and our local homeless. Our vision is of a world in which no one dies because of a lack of access to soap. This is the simple version of what we do. The reality involves partnerships, distribution logistics, behavior modification, hygiene promotion, sustainability planning, monitoring and evaluation. It’s all easier said than done, but the world’s waste can and should be repurposed for good. Officially my title is Operations Director, but as anyone who has worked in a small organization knows, I wear many hats. I manage the hotel partnerships, I run the volunteer program, I identify soap distribution partners and arrange shipments, I answer the phone and all general inquiries, I post on Facebook and tweet, etc. But the best part of my job is when I get to go in-country and observe our partners distributing soap. I get a tingling feeling and I exhale. Our soap, which has now made it to 28 countries, brings with it hope and dignity as well as health. Soap! Such a simple thing most of us take for granted. I’ve learned from this job to be thankful for what I have. I struggled with that for a long time, always wanting more, anticipating something better up ahead. I now realize that I already have far more than I need. So, this is where I am–working in water, sanitation and hygiene. HERE can mean Atlanta, Georgia, where our headquarters are—or it can mean any one of the sites we visit. Whatever it means, I know this: I feel intimately involved in international development and global health. And I like it HERE. Lilly Dimling works as the Operations Director for the Global Soap Project, based in Atlanta, Georgia. Fabulous post Lilly! What an inspiration you are! Love the story of The Global Soap Project. Just fantastic!